The Hidden Scar: The Story of the Willow Leaf Eyebrow ~ Folktales Stories No Reviews Posted. ONCE LONG AGO IN CHINA there lived a girl named Chen Lien who was very self-conscious about a large scar, caused by a childhood accident, that crossed one of her eyebrows. If by mistake she happened to catch her reflection in a mirror, she quickly turned away; the scar seemed three times larger than it really was to her. And so she avoided mirrors and reflections at all costs, and as she grew to become a young woman, she preferred to spend more and more time alone in the garden. Yet she remained helpful and pleasant to all. One day a rich young man named Wu Tang was visiting Chen Lien's neighbors in the house next door. As Wu Tang was climbing in the trees searching for bird's nests, he happened to notice Chen Lien in the garden below, over the wall, stitching embroidery and humming to herself. He was so entranced by the young woman, who moved as gracefully as a willow branch and whose sweet voice hypnotized him, that he nearly fell from the branches. It so happened that the maiden sat with her good side facing toward him, and Wu Tang thought her the perfect vision of a soul mate. He scurried down the tree. "I have found my bride!" Wu Tang declared to his parents. "Call the matchmaker at once." And so the matchmaker was summoned. After the usual discussion of gifts and negotiations, the matchmaker asked all others to leave the room. "I must have a moment alone with the young man," said she. "Wu Tang," said the matchmaker. "As you know, the young woman is from a good family and carries herself with the grace of a princess. But there is something you may not know about her. You should know about a flaw to her beauty." "I have seen her with my own eyes!" exclaimed Wu Tang. "I will not hear you speak of any flaw!" And so the wedding arrangements proceeded on schedule. Soon the day of the ceremony was at hand. Never was the garden of Chen Lien's home more lovely, decorated with fresh flowers from stonewall to treetop. 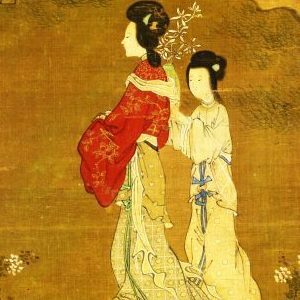 Yet while Chen Lien was standing in her bridal fineries, she felt uneasy. In the last moments before the ceremony began, she anxiously turned to her mother. "Are you sure the matchmaker told him?" "Yes, my child, I told you a hundred times," said her mother. "She absolutely told him about your eyebrow and it does not matter to him in the least." And the mother adjusted her daughter's veil. Yet as Chen Lien watched her husband-to-be laughing and talking with guests, she worried, "If he had been told, why wouldn't he try to glance at me to try to see the scar through my veil? Why does he seem so unaware of it?" After the wedding ceremony, the two of them were alone. The new husband lifted his bride's veil, and who can blame him if he was startled when he first saw the eyebrow? Poor Chen Lien saw the surprise on her husband's face. She said, "Good husband, did not the matchmaker tell you of my bad eyebrow?" The young man was silent, so she went on. "When I was a little girl," she said, "my family was traveling far away to visit friends. I was playing in their garden when a little boy threw a heavy stone. I'm sure that he did not wish to hurt me, but it hit me on the forehead, and cut this gash where you now see a scar. I am sorry that I cannot come to you, my husband, perfect in every way." "O my bride," said Wu Tang at last, "what was the name of that little boy who threw the stone?" "Alas, I do not know; he was a visitor there like myself." "Was the garden in which you were playing that of the Li family in the city of Peking?" whispered Wu. "O excellent husband, how could you know that?" "Because that boy was myself," said Wu. "My parents have often told me how I once threw a stone and cut the forehead of a little girl in the gardens of the Li family. It must be destiny itself that our ankles are now tied with the silken cord of marriage, so that I might finally make amends to you for the injury I caused. And now I know exactly what I must do." He called for the finest black ink and his thinnest writing brush, and with the brush and ink he drew a new eyebrow right through the scar. It was thin and curved, like a willow leaf, and it was so much like Chen Lien's other perfect eyebrow that no one could tell them apart. For all the many happy years that the two lovers lived together, every morning the husband Wu Tang painted a new willow-leaf eyebrow over the scar that he had made. And so the two of them lived their lives in perfect contentment.